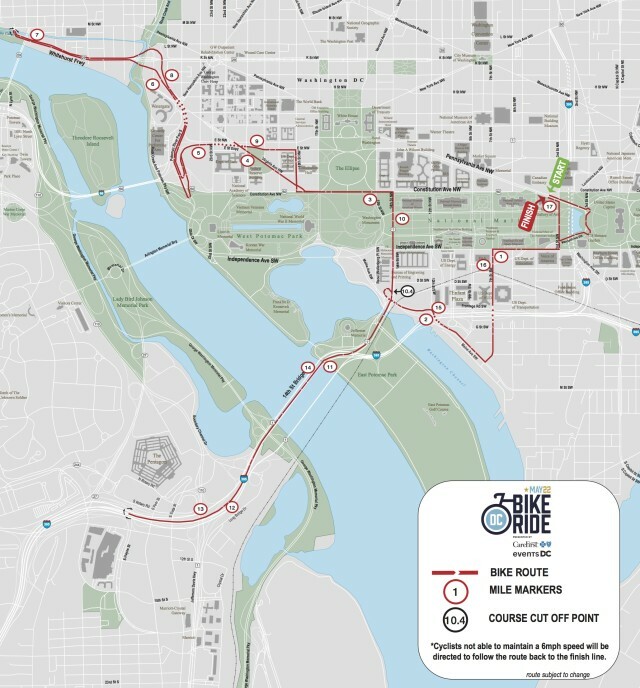 “DC Bike Ride, a scenic urban bicycle ride celebrating the people, places, and culture of Washington, D.C. will debut in the District on May 22, as an exciting addition to National Bike Month celebrations. White House and the John F. Kennedy Center for Performing Arts. Participants will conclude their journey with a post-ride celebration near the United States Capitol. The inaugural 2016 event expects to include 8,000 riders, but the ride is projected to grow to 18,000 in the coming years, becoming a premiere recreational cycling event on the east coast. Washington, D.C. provides the perfect locale for the event. The District was recently voted Walk Score’s “Most Bikeable City of 2015” and boasts one of the largest bikesharing systems in the United States. Washington, D.C. is also home to Vision Zero, a long-term street safety initiative, which works to end traffic deaths and major injuries for all road-users. Vision Zero was recently adopted in the District of Columbia and is supported by WABA (Washington Area Bicyclist Association). As the primary benefactor of the inaugural DC Bike Ride, WABA will receive a portion of the proceeds to fund street safety programs carried out by the organization.